Throw a Denton Snow Party For Your Next Event! Located just north of the Dallas Fort Worth metroplex off Interstate 35 in North Texas, Denton is a popular college town and well-established community in Texas that is home to the University of North Texas (UNT), Texas Woman’s University, and the North Texas State Fair and Rodeo. With many annual events and festivals, sporting events, and local party gatherings, Mr. Cool Snow Parties is proud to be the leading provider for Denton snow parties. With over 50 years of experience producing snow and providing year-round snow parties, many of our Denton snow party clients have requested our service for school and college events, church events, corporate parties, and so much more. No matter if it’s June, September, or December, Mr. Cool Snow Parties can deliver snow to your location anywhere in Denton, TX. Not only do we produce fresh, white powdery snow, but we can also build a snow slide for your party, which will add even more excitement and attract more attendees and visitors to your event. If there is no slope or incline at your Denton snow party location, you can also rent the Mr. Cool Luge, our mobile snow slide. Whether you’re throwing a kids birthday party with 20 guests, a church event for your entire congregation, or a large community event with thousands of patrons, having a snow party in Denton by Mr. Cool Snow Parties will bring joy and laughter to every child, parent, and friend as they play together in the snow. Our snow is high-quality snow; it is just like real snow, so your guests will be able to make snow angels, build snowmen, and make snow balls. 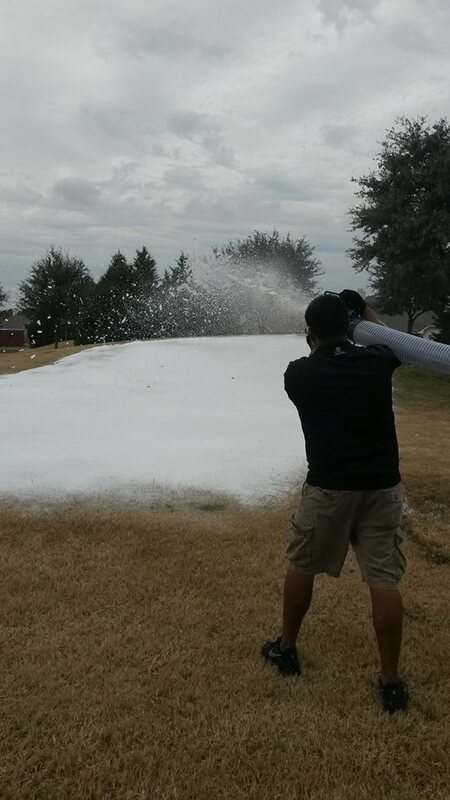 Make your next party the event of the year by throwing a snow party in Denton, TX. As a subsidiary of Emergency Ice, Inc., Mr. Cool Snow Parties has many years of ice and snow party production experience. As proud members of the International Packaged Ice Association (IPIA) and a continued A+ rating with the Better Business Bureau, you can rely on us to provide top-quality snow party service for your next Denton event. Contact us today at 214.631.3535 or 1.800.400.8221 so we can create a winter wonderland experience for your next event that everyone will enjoy.